When I was a kid growing up in Minneapolis, I loved to help Mom prepare a roast, steam string beans from our garden or bake a cake for Dad's lunch. Her artful cooking inspired me to become a good cook like she was! I love to entertain guests with delightful brunches, tasty picnics, and sumptuous dinners. Christmas and Thanksgiving give me a chance to do my favorites: wild rice, sausage stuffing, sweet potato souffle and apple pie. Back in 2000, a friend suggested I write a cookbook for toaster ovens. I was amused. "How many ways can you do toast?" I asked her. Little did I know what toaster ovens can do. As I researched recipes, converting them to toaster oven proportions, changing the ingredients to healthy, low fat, low calorie offerings, I eventually came up with over 250 great recipes for my cookbook, "Pop It In The Toaster Oven." Indeed, artful cooking can be done in a toaster oven! I have been hooked on toaster ovens ever since and have created over 50 toaster oven videos that show how to prepare the simple, tasty recipes from the cookbook. So, I've made a lot of videos demonstrating recipes from my toaster oven cookbook "Pop It In The Toaster Oven," but lately I have been so inspired to write about organic gardening and using ingredients from your own garden.I is something I've been doing for several decades. So, I am posting pictures of my garden with hopes of inspiring my viewers to make a garden and garner the healthy rewards from it. That said, realize that I live in a small house with a small back yard and my garden is no bigger that a 9 x 12 inch living room carpet. But I find that I can enjoy eating stuff that I planted and know that it is pesticide safe and it is truly organic. And, yes, I do compost, just dig my peelings into a part offside of my garden. If you like being in control of what goes into your body, how you can ward off sickness and live longer, this may be the way to go for you. At 75, well, here I am, still "alive and kicking", as they say. I must say that what comes out of the garden tastes soooooo goooood! View my information Artful Gardening pages to find out more. 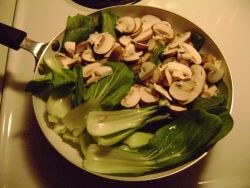 Baby bok choi, mushrooms and with greens from my garden! I put them all in a skillet with some toasted sesame oil (abut 2 tablespoons,) some garlic powder, tamari to taste. What, like five minutes of stir fry. It was delicious and so satisfying! Carrots. 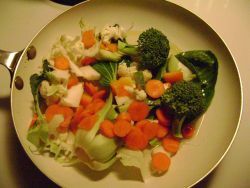 baby bok choi, broccoli, cauliflower stir fried with ginger, minced garlic and a teaspoon of fish sauce. 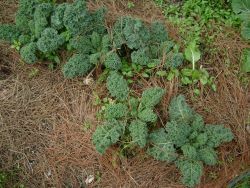 Kale and collard greens from my garden, stir fried with rice noodles. and can be put right away into your frying greens. If you try this, your tummy is like you are eating a steak--full, satisfied, but with much a healthier option (no bad fats, no red meat challenges and a lot less calories.) 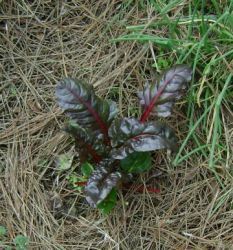 So, get your garden going, reap the rewards from seeing the plants coming up and eating your own stuff. Click here for my Artful Cooking Blog. More "Pop It In The Toaster Oven" recipes, but in an easy-to-view format..
What is the difference between cooking and artful cooking? The main goal for most of us is to get the food on the table, eat it and go on to other things. The belly is full, the basics are fulfilled. I have to admit, I've been there myself, especially when I was working as a single mom and taking care of my little daughter. Picking her up after daycare and racing home to get a meal on the table before bed and story time was quite a challenge! It wasn't until she was older and my own professional life calmed down, that I could spend a bit of time and not just a "throw on the table" meal. And it was a blessing to sit and chat with my little girl and savor a good meal of healthy ingredients, cooked to perfection. Artful cooking provides a totally different experience from quick cooking your way to the next event in your life. And in the long run, we are all better for it. Refraining from buying packaged meals, fast food, junk food will give us more nourishment, more energy and, ultimately, a longer life. A consideration of what will be served, the enjoyment of that meal's creation and the pleasure of eating is an enriching experience. The joy of cooking a meal and artful inspiration makes breakfast, dinner or supper a fulfilling experience, stomach-wise and brain-wise. Artful cooking begins at the grocery store with a search for good ingredients for a delectable repast. Fresh fruit and vegetables, quality beef, poultry, fish and seafood guarantee tasty, healthy and delicious results. Do you have favorite cookbooks? There are many in the bookcase in my kitchen( including "Pop It In The Toaster Oven," the cook book I wrote!) that I refer to frequently. But, there are also times when I look in the fridge, see a few items that inspire me and decide to create a meal from those items. I actually have a recipe called "Empty The Fridge" in my cookbook. Writing recipes for a cook book specifically for toaster ovens was a wonderful and inspirational experience for me. I researched a wide variety of good healthy recipes and downsized them to a toaster oven size. I created low fat, healthy, nutritional recipes, changing frying and sauteeing to baking, switching out fat and sugary ingredients for low fat, low complex sugar or no fat ingredients. Artful cooking for the toaster oven! Take a look at my toaster oven cookbook, "Pop It In The Toaster Oven" It has over 250 delicious, healthy recipes created for energy-efficient cooking! "You may be asking," What can my toaster oven really do?" Perhaps you think that a toaster oven cookbook consists of nothing more that a hundred dreary variations on toasted cheese sandwiches. But you'd be mistaken! The toaster oven can go far beyond just "toasting." The BROIL function can caramelize sugar, saute onions and peppers, and produce stir-fries, crisp hash browns, and quick cake layers for a torte. The BAKE function makes perfectly cooked grains, soups, and casseroles. And because all the uncooked ingredients are combined in a baking dish and baked to completion, there's the added advantage of no "watched pot.."
The TOAST function produces excellent sunny-side up eggs and omelets. In fact, an awesome variety of healthy meals can be created in a toaster oven via one or more of the standard functions and using only one third to one half the energy required by a full size oven!" One of my favorite recipes from "Pop It In The Toaster Oven"
These chicken thighs make an excellent appetizer served with the low-fat Blue Cheese Dip or an entree with Crisp Cajun Potato Wedges. Preheat the toaster oven to 450 F.
Brush the chicken thighs liberally with the lemon juice. Set aside. Combine the seasonings in a small bowl and transfer to a paper or plastic bag. Add the thighs and shake well to coat. Remove from the bag and place in an oiled or nonstick 8 1/2" x 8 1/2" x 2" square (cake) pan. Cover the pan with aluminum foil. Combine all of the ingredients in a small bowl, adjusting the seasonings to taste. If the consistency is too thick, add a little buttermilk. If it's too thin, add a little blue cheese. Here are some top products I recommend for toaster oven cooks! Toaster ovens in a wide range of prices, depending on the oven's capabilities. I favor Cuisinart. I've had two and presently have the TOB 195 which has a convection setting and a key pad, rather than knobs. Cleaning is super easy and the roomy design with an accessible pull out shelf permits a broad variety of baking and broiling options. Good revues go also to the Breville toaster oven. Both brands offer inexpensive to more expensive models, all of which are designed well stand up well to heavy use. Cuisinart also offers a steam, convection toaster oven which expands baking and cooking options further. Click here for some great reviews of toaster ovens on the SweetHome website! Some of the things I learned while writing "Pop It In The Toaster Oven,"
It seems that a lot of people these days think that fast food is cheaper than buying food at the grocery store, spending extra on gas to take it home and then having to take the time to prepare it. And, at first glance, it does seem cheaper and more expedient to grab take-out on the way home from work and plop it on the table. But, keep in mind that someone transports the ingredients to the store or take-out place and then someone is employed to cook, package and sell the fast food. You will pay for that if you buy that kind of product. And you may pay again later, health-wise. 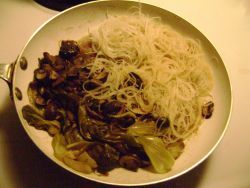 There are ways of preparing "slow" food that definitely save money and are more economical that fast food. For example, a bag of carrots at $2.49 will produce several meals for a family of three or four. They can be cooked with meat and potatoes in a stew, served as a side dish with pasta, expand a garden salad and offer great healthy school and work snack alternatives. But the most important factor above and beyond the budget is health. Across the board, ingredients in burgers, hot dogs, pizza and Chinese food are full of fats, salts and exotic five syllable artificial ingredients to enhance the flavor, color, texture, etc. And these entrees are accompanied by equally harmful sides of french fries, buns, and quart-size quantities of soft drinks. We are a nation of diabetic and obese children, adults and elders because of our eating habits. And we are loyal to the advertisers of these destructive products, believing what they say about good-tasting, popular, trendy, mouth-watering, can't get enough foods that they chemically concoct and package seductively. Obesity in children, teens and adults is the evidence of our faithful and frequent fast food consumption and down the road diabetes, heart problems, high blood pressure, lack of energy are the results of high fat, sugar, salt and artificial colors and flavors in fast food. Consequently, lets factor in medical bills, sick days, attention deficit problems related to high sugar and salt consumption. So what is really cheaper in the long run? Fast food or real food like vegetables, fruit, cheeses, yogurt, whole grain breads, pasta and lean meat? Now that food is on your mind, why not grow your own? Click here for a great Web site I recommend for beginner gardeners who would love to know how to grow a successful vegetable garden. Do you own a toaster oven? Do you use it? If you don't, perhaps you should purchase my "Pop It In The Toaster Oven" cookbook and be inspired! Here's Charley! Handsomer than ever! The store market shelves are full of product dog food and cat food lines we should believe in. But, wait, what are the ingredients? Read and find out. The first several ingredients are the major portion of the product. If that includes by-products of any kind, think twice about purchasing the product. Unfortunately much of the pet food on grocery market shelves is not good for your dog or cat. If you look at the ingredients you will see that even in the well-advertized brands like Purina and Iams, and even at your vet's Science Diet, there will be animal by-products listed as the first, second or third ingredients. That means that a good part of that product can include just about anything including offal from the three DDD's--dead, dying and diseased animals, and which my also include euthanized dogs and cats, heavy metals and other toxic ingredients. Also, many dogs and cats have grain allergies, including wheat and corn products, much of which is on the market shelves and in large portion in popular brands. If your pet is not doing well, you might want to consider changing to a better, grain-free, safer product that will enhance their lives and give them a good, healthy future. Check with your vet if your dog or cat is not eating well, vomiting periodically, itching and scratching incessantly, or is listless. All of these symptoms may mean something else, but many times, changing your dog or cat's diet can improve their lives and keep them with you, healthy and strong well into the future. Charley does not have allergies to grains, but he likes the quality grain-free products so often that is what I purchase for him. Here are some of Charley's favorite dry dog food brands. I must confess I also augment his dry kibble meals with cooked chicken (boneless), ground turkey, leftover vegetables (spinach and collard greens, carrots, beets)mixed with brown rice or oatmeal. I believe all dogs should eat good healthy food. At eight years old, Charley has a lot of energy, his teeth are good and his coat is shiny. Nutrition is the best investment you can make for keeping your pet happy and healthy! 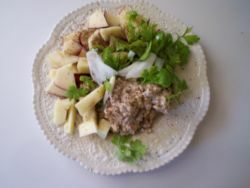 Here's Charley's blog and some great, healthy dog recipes! 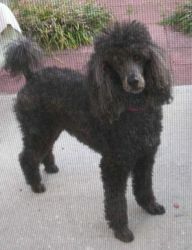 Visit Pleasantly Plump Pets blog and get some great healthy dog recipes! Lois, Thank you so much for this video. You have really outdone yourself on this one. I am truly inspired to give this a try! This is really stunning! I love it. I wanted you to know that you have been a real blessing to me. After the sudden passing of my husband (of 33 yrs.) I decided to take up art, and your site was one of the first I came across. It was, and still continues to be one of my favorite sites for inspiration and relaxed learning. You're a gem. Keep it up!